Las Vegas authorities have released dozens of 911 calls from the Oct. 1 shooting, shedding light on the panic and chaos that ensued at the Route 91 Harvest country music festival as bullets rained down from an unknown gunman 32 stories in the sky above. In one call between a 911 dispatcher and the fire department, the dispatcher says that there are “possibly 20 subjects down” and that numerous calls were coming in reporting an active shooter. 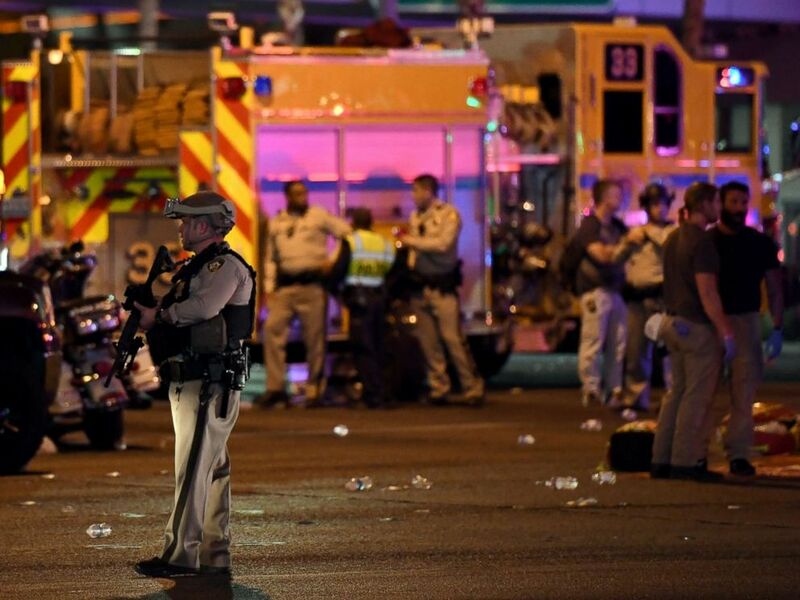 The dispatcher then says that 33 calls are on hold, and they are getting calls of a man who had been shot with a pellet gun at the Mandalay Bay Resort and Casino. Drapes billow out of broken windows at the Mandalay Bay resort and casino on the Las Vegas Strip, Oct. 2, 2017, following a deadly shooting at a music festival. In a later call, Mandalay Bay’s security dispatch says there’s an active shooter in Room 32135, adding that the shooter is inside the room and managers are on the rooms below and above it. “Pretty much, they can just hear what sounds like semi-automatic rapid fire, and we have an officer that has been hit,” the dispatcher says. Another call detailed that people had been shot and “everyone’s running to get out of here” as terrified concert-goers yell in the background. 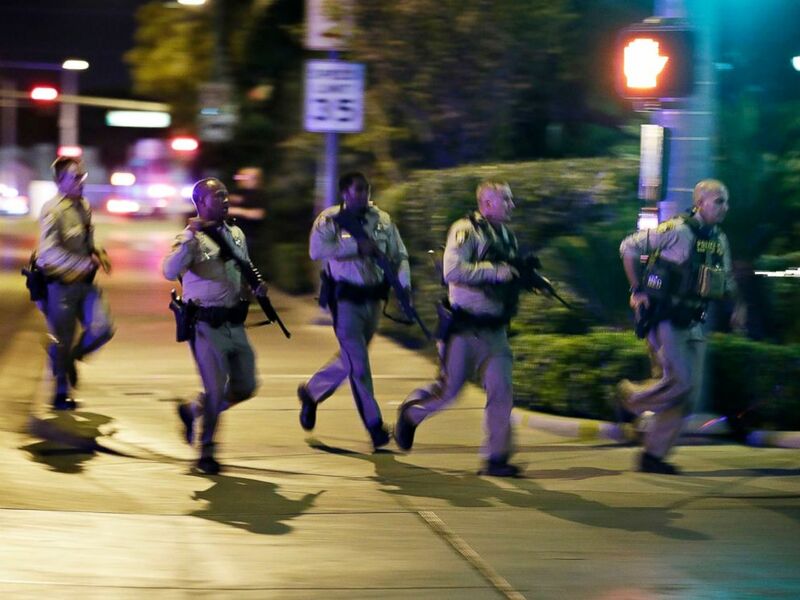 Police run at the scene of a shooting near the Mandalay Bay resort and casino on the Las Vegas Strip, Oct. 1, 2017, in Las Vegas. One caller detailed that 100 shots had been fired, likening the sounds to a machine gun. Another concert-goer said that about 100 people were continuing to hide in a “beverage container,” although shots hadn’t been heard in about two minutes. Some callers detailed the conditions of the wounded near them. One woman had been shot in the head, and another detailed another victim that was “bleeding out.” One caller told dispatchers that he had been shot in the leg and was hiding in a business that he busted open a window to get into. A police officer stands in the intersection of Las Vegas Boulevard and Tropicana Ave. after a mass shooting at a country music festival nearby on Oct. 2, 2017, in Las Vegas. Authorities also released video taken from a rooftop that shows people tending to victims below. 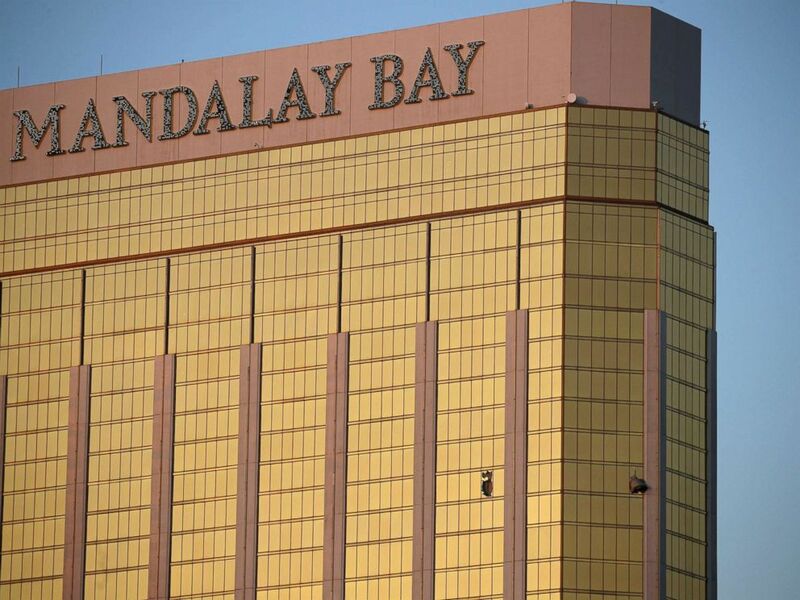 Fifty-eight people were killed and hundreds more injured when gunman Stephen Paddock opened fire from his suite on the 32nd floor of the Mandalay Bay Resort and Casino.